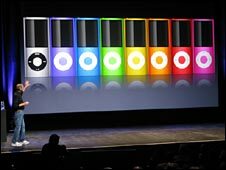 The fourth generation Nano was launched at a US press conference by Apple chief Steve Jobs, who announced new shuffle and library features. He also listed the Nano's environmental credentials, including arsenic-free glass and a mercury and PVC-free body that is "highly recyclable". The Nanos are expected to sell in the UK for £109 ($191) for the 8GB version. The 16GB version will retail at £149. 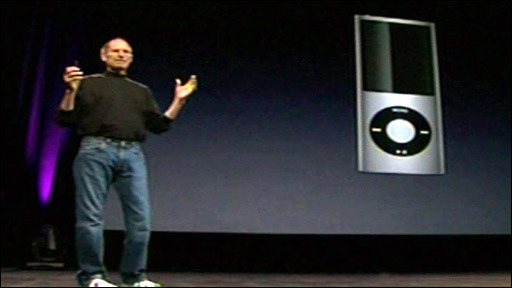 Speaking live in San Francisco, Mr Jobs unveiled Apple's new Genius function which allows users to create automatic playlists from the iPod's library with the click of a button. He said the function worked by taking one song and creating a playlist based on the user's song library and could also suggest other tracks the user might want to buy. Mr Jobs described the new Nano as "highly recyclable"
Mr Jobs said the new Nano also had a "shake to shuffle" mode, which sends the gadget to shuffle mode with the flick of a wrist allowing you to go backwards and forwards on your playlist. 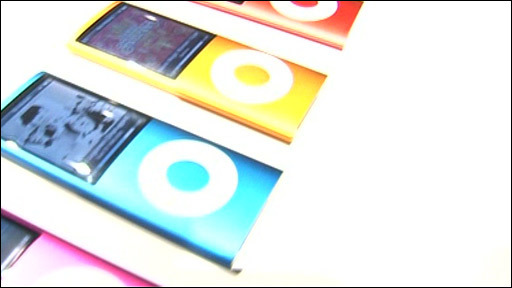 The Apple chief executive officer said the company had sold more than 160 million iPods since its introduction seven years ago. An updated iPod Touch - the closest cousin to the iPhone - was also announced at the event. It is thinner than previous models and has integrated volume controls and a built-in speaker for "casual listening" and will also include the Genius function. New software for the iPhone - which will be available free to all users - would "fix a lot of bugs" including dropped calls and connection problems reported by customers. 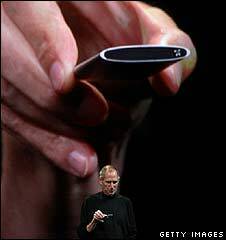 Mr Jobs said: "We're really, really excited about all these products. We think people are going to have a lot of fun." The Apple announcement was much touted on the blogosphere for days leading up to the launch with plenty of speculation about what would be unveiled. Gizmodo's Jesus Dias was not disappointed and said "iPod touch second generation rocks our socks off." However Craig Grannell of Cult of Mac said "Fairly modest expectations were barely met and all we got were skinny things we already knew about anyway." Apple co-founder Steve Wozniak told the BBC that this line up of new products did not deliver the way the company has in the past. "I don't like to sound like I am putting products down. I like new pieces of hardware and I didn't think it was the biggest one of all time for Apple. "But then we don't present like we do at our Mac World Expo. Some of our introductions are weaker than others and we didn't really expect an awful lot from today." Wall Street's reaction was also fairly lacklustre with Apple's share price actually falling more than 7 points during the course of the event from $159.64 (£90) to $152.12 (£86). Some analysts however were more than happy with Apple's product launch. "These are evolutionary products with some revolutionary new features," Michael Gartenburg, vice president of Jupiter Media told the BBC. "Apple has done it again. They have reinvented the line in a way to capture mainstream consumers' hearts and minds and doing at a price point that is extremely affordable."